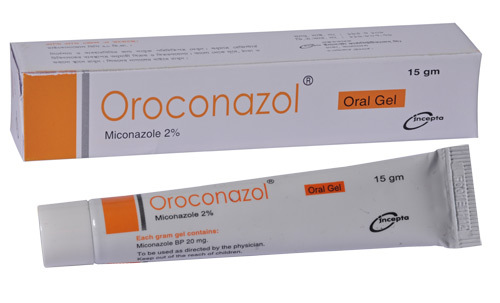 Oroconazol Oral Gel: Each gram gel contains Miconazole BP 20 mg.
Miconazole is a synthetic imidazole antifungal agent with a broad spectrum of activity against the common dermatophytes and yeasts as well as an antibacterial activity against certain gram positive bacilli and cocci. It acts by inhibiting ergosterol biosynthesis in fungi and change in the lipid components in the membrane, resulting in fungal cell necrosis. Oral treatment and prevention of fungal infections of the oropharynx and gastrointestinal tract and of superinfections due to Gram-positive bacteria, including oral candidiasis and denture stomatitis. Adults: One or two spoonfuls (5-10 ml) of gel four times daily. Children aged 6 years and over: One spoonful (5 ml) of gel four times daily. Children aged 2-6 years: One spoonful (5 ml) of gel twice daily. Infants under 2 years: Half spoonful (2.5 ml) of gel twice daily. For localised lesions of the mouth, a small amount of gel may be applied directly to the affected area with a clean finger. For topical treatment of the oropharynx, the gel should be kept in the mouth for as long as possible.Treatment should be continued for up to 2 days after the symptoms have cleared. For oral candidiosis, dental prostheses should be removed at night and brushed with the gel. Occasionally nausea and vomiting have been reported, and with long-term treatment diarrhea. In rare instances allergic reactions have been reported. If the concomitant use of Miconazole and Anticoagulant is considered, the anti-coagulant effect should be monitored and titrated. In infants and young children, caution must be taken to ensure that the gel does not obstruct the throat. Hence, the gel should not be applied to the back of the throat and the full dose should be divided into smaller portions.